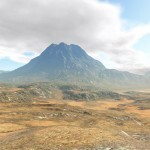 TerrainComposer has been a top selling terrain tool in the Unity Asset Store since version 1 was released 6 years ago. TC 2 is the follow up of TC 1. TC2 is a powerful node based multi-terrain tile generator. TC2 makes use of the latest GPU technology to give you instant real-time results, which makes creating terrains faster and more easy than ever before. TC2 its folder like layer system and workflow is similar to that of Photoshop, which makes it possible to have full control and make quick changes any time during the workflow. 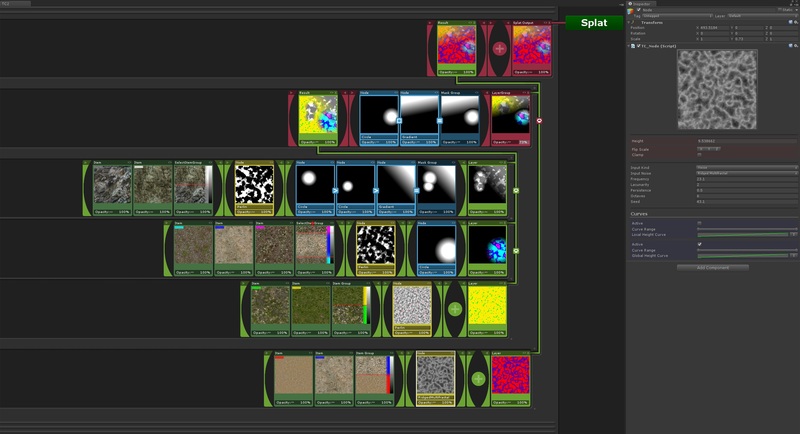 With TerrainComposer 2, I took very special care to make it beginner friendly and to make it a breeze to work with for artist and programmers. This is very important also because with TC2 you can create terrains on an enormous scale with unlimited amount of biomes and at all times you need to keep a good overview. 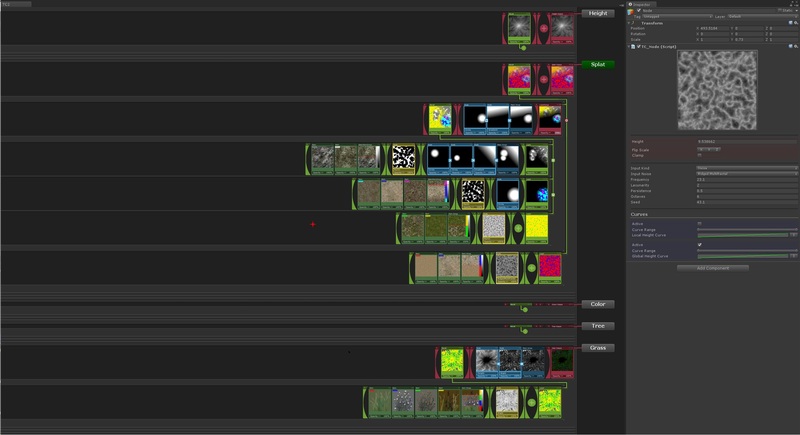 TC2 has a linear graphical node interface with preview textures where you can exactly see what happens on each node, each group and on each level. The whole system is linear and TC has automatic alignment of the nodes, layers and layer-groups, so no hassling for moving nodes around and no crossing node connection wires all over your screen. TC2’s node window Hierarchy is using Unity’s GameObject system, so you can skip a learning curve there. TC2 can be learned within a few minutes if you are familiar with Unity’s GameObjects. It has everything build in what you already know from Unity: positioning/rotating/scaling, duplicating, drag and drop, and very important undo. The GUI in the video is replaced by the official one. 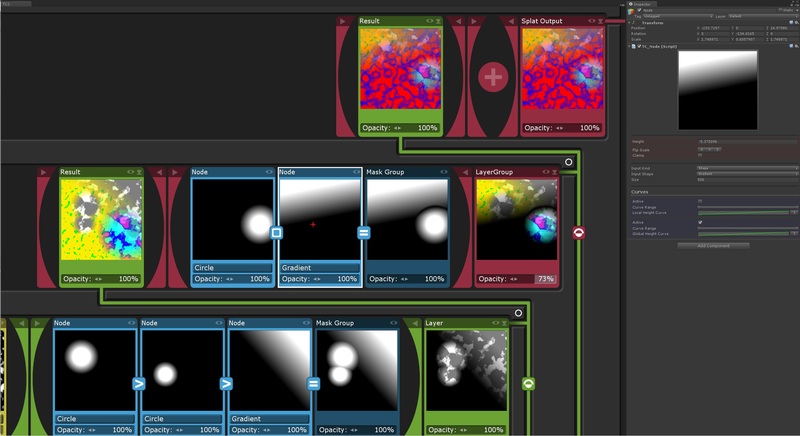 An powerful extension ‘Node Painter‘ extension (developed by Seneral) has been released for TerrainComposer2. You can get it for Free on the Unity Asset Store. What is TC2 Node Painter? TC2 Node Painter allows you to paint TC2 nodes directly in the editor, greatly improving your terrain creation workflow, both procedural and manual. Using this tool you can paint everything, from simple heights and splats over stone fields and forests to whole biomes with little setup required thanks to TC2’s simple node editor interface. It basically can be compared to the Unity terrain brushes but then for multi terrain tiles and much more powerful. A big advantage over the Unity terrain brushes is that you can paint on unlimited amount of layers and masks like in photoshop, and move/rotate/scale these with TC2’s powerful node transforms. – Paint anything – even whole biomes! Screenshots of terrains made with TC2. 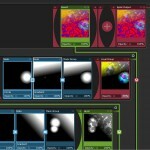 Includes many examples and presets. Multi terrain-tile support out of the box, TC2 treats it as one terrain. Linear graphical node based GUI interface. Specially designed for user friendliness, cleanliness, overview and scale ability. For beginners its a easy to learn and for experts and artists a breeze to work with. Folder like layer system which is similar to Photoshop its layer system. Advanced masking, use an unlimited amount of masks on a layer and layer group. Makes use of the latest GPU technology to give real-time results. No need for visualizers, guessing and waiting what might happen. No hassle with aligning of nodes and no crossing node connection wires all over your screen. Just drag and drop your node where you want it and it will snap in place. 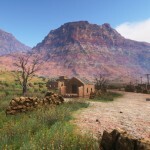 One powerful workflow to create a complete terrain with height-maps, splat texturing, color-maps, placing vegetation and objects. Advanced presets. Uses Unity’s drag and drop prefab system to save/load presets which can be a node, a layer or an entire layer group. Biomes, unlimited freedom with the amount of nodes, groups and levels. Each group/level can be masked, transformed, cloned and saved/loaded with drag and drop. Which makes it possible to create terrains within your terrain. Terrains are fully scale-able and expandable. TC2 generates in world space. So no matter how you position the terrains or how many terrain tiles, it will always generate at the same position. So you can expand/shrink your world anytime during the workflow without the need of re-positioning or re-scaling of nodes. Export height-maps, splat-maps, color-maps and normal maps. Automatic terrain adapting based on manually placed objects. The way the terrain and spawned objects adapt is all based on how you setup the nodes with rules in TC2. Included complete noise library including erosion looking noises: Perlin, Billow, Multi-fractal, Cell noise, IQ, Swiss, Jordan and Random with each many variations. Many node rules like height, angle, splatmap, collision, convexity, noises, mathematical shapes, images and 16 bit raw images. Mathematical shapes: Circle, gradient, rectangle and constant. Can be used in runtime and generates ultra fast, needs DirectX11 or Metal. Included source code with clean C# code. Each node type and node groups have its own GameObject with attached script and can be easily modified in run-time. Advanced and easy to use stamp node, and includes high resolution stamps. Image node for using images for input and masks. Mesh collision detect system that is independent of physics colliders and is pixel accurate. Global seed and a seed on many levels for the procedural noises to create randomized terrain. RTPv3 integration with auto color-map and normal-map assigning. Node window uses culling and can contain a huge amount of nodes. What is not on the screen is not drawn. TC2’s GUI has scrolling/zooming/easy foldouts/drag & drop and many more features. Here are some screenshots of TC2 with the official GUI. This screenshots below I just took of a terrain I put together by playing 5 minutes with TC2. Some quick settings with 2 stamps and 1 perlin noise heightmap, 8 splat textures (without normals assigned) that are included in TC1, and 4 grass textures. There’s no RTP, just standard Unity terrain shader. There’s Time-of-Day and some image effects (SSAO and Scion). So with TC2 you will be able to make even better looking 24 hour demo’s in 5 minutes…Terrain creation goes very fast because TC2 updates the terrain instantly, adjustments made will animate the terrain. Not only great care is taken about simplicity, clean interface, usability etc. But TC2 has an enormous increase in power, freedom, scale ability, diversity and performance. 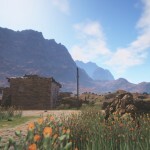 TC2 is truly a ‘Next Generation’ terrain tool that can generate on the GPU, making it able to create and update terrains with frames per second that makes it even possible to animate terrains. Second TC2 is an unlimited blending powerhouse. With TC2 you can create an immersive amount of diversity. As in TC2 everything is group able and groups can be grouped and those can be grouped, etc. Every group is mask able and transformable. And any group or node you can drag and drop it in your project to save as a prefab and drag and drop it back anywhere in TC node window. So any adjustments can be made anytime during the workflow on any group level without any waiting time. What I mean you can create terrains within terrains! We’ve all seen nice terrains with uniform texturing and placement, but what makes a terrain stand out is its diversity in my opinion. To not bore your gamers/users you need dynamic terrain and with TC2 you can create unlimited biomes on small scales and very large scales, you name it. If you still want a classic uniform terrain of course that is also possible. This video is a quick showcase of the manual object placement feature of TC2. Have the terrain and spawned objects automatically adapt based on the rules you setup to your manual placed objects! P.s. This video is from before I made TC2 official GUI so it still has the old prototype GUI.